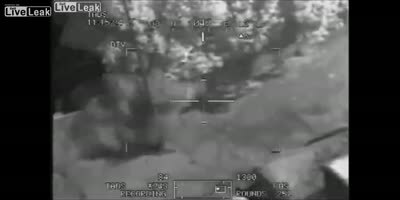 This is from an MQ-1 Predator self-lasing a Hellfire. Not a terrible shot, crosshairs were doing really well right up to the end. They left a live one @ the 3 o'clock position from vehicle. (see moving guy from 01:15 to 01:19) It's quite unusual for them to not mop-up with machine-gun !